Day 1: Jakarta/Bali Upon arrival at the International Airport, you will be pick up by our guide and drive you to the hotel. Briefing and gear check then welcome dinner from us. 4 Day 4: Nabire–Sugapa-Suwanggama Fly to Bilogay Airport using a chartered flight that takes about 45 minutes. Arriving at Bilogay, we continue to Suwanggama Village by motorcycle. The last village we meet on the way to Base Camp. Stay overnight here. 5 Day 5: Suwanggama–Dibasiga (2,350m) We start early in the morning. It will take 6.5 hours to the first camp, Dibasiga. From Suwanggama, the trek will go down to Yabu River. Then follow the river upstream. On the way, we’ll pass a small pool contain of salt water. There’s a factory there that produce the salt from this pool. It’s unique that there’s a source of salt on the mountain. The trek will be vey muddy all the way to the Base Camp. 6 Day 6: Dibasiga–Estasiga (3,235m) The distance to the next camp will be further today. It will take 9.5 hours to Estasiga. Start early in the morning. We will cross the river a couple of time today. The terrain will change from lower mountain forest to the upper mountain forest. Before that, we will pass a small meadow with a lot of beautiful orchid flower. Then, go inside the forest again. The trek will become very gnarly all the way up until we meet another meadow, Estasiga. Set a camp here. 7 Day 7: Estasiga–Ebai (3,600m) From today, we will walk on the meadow. The trek will go up until 3,800 m, and then going down again until 3,600 m. It will take 8 hours today. From here, we could already see the Great Mountain Range of Puncak Jaya with the snowcap and it’s magnificent north face. 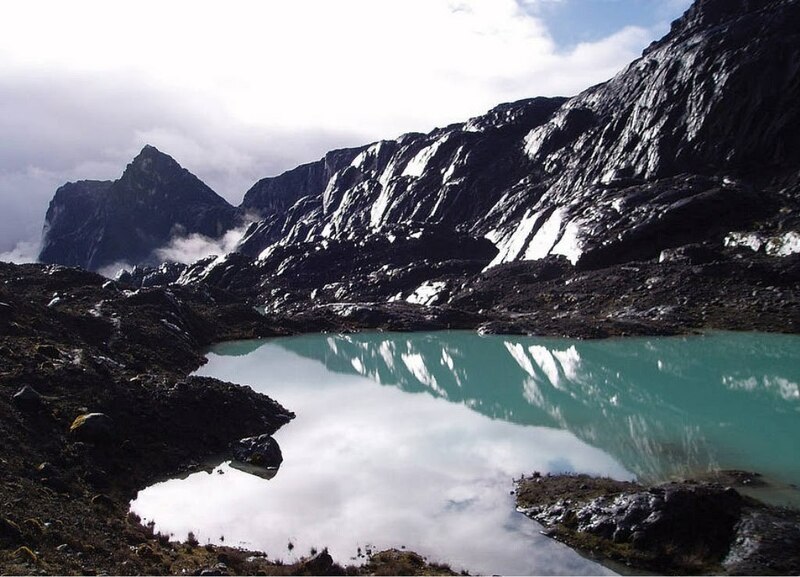 9 Day 9: Nasidome–Carstensz Base Camp (4,250m) The trek starts uphill, passing a ridge to Lake Larson. It will take 2 hours to Lake Larson from Nasidome. And then continue to the New Zealand Pass. We start entering the mountain range, into the rocky terrain and finally arrive lake valley, Carstensz Base Camp. It takes 4 more hours to Base Camp from Lake Larson. 10 Day 10: Carstensz Basecamp Acclimatization day. You can rest and relax. And prepare for summit attack. 11 Day 11: Carstensz Base Camp–Summit–Carstensz Base Camp Summit Day. We will start at 2AM. First we walk pass through middle ridge to the Yellow Valley until the foot of the face. And then we start climbing using ropes that already been fixed. Arriving at Summit Ridge, we have to cross a gap with Tyrolean Traverse. Continue walking for an hour and finally reach the summit. Then go back to Carstensz Base Camp. 12 Day 12: Spare days Spare day for anticipation of bad weather or other major constraints. Or we can use it to climb Ngga Pulu / Puncak Jaya. 13 Day 13: Carstensz Base Camp–Nasidome Trekking back to Nasidome. Stay overnight there. 16 Day 16: Dibasiga–Suwanggama Trekking back to Suwanggama, stay overnight. 17 Day 17: Suwanggama–Nabire Use motorcycle from Suwanggama to Sugapa airstrip. Fly to Nabire. Stay overnight in hotel.